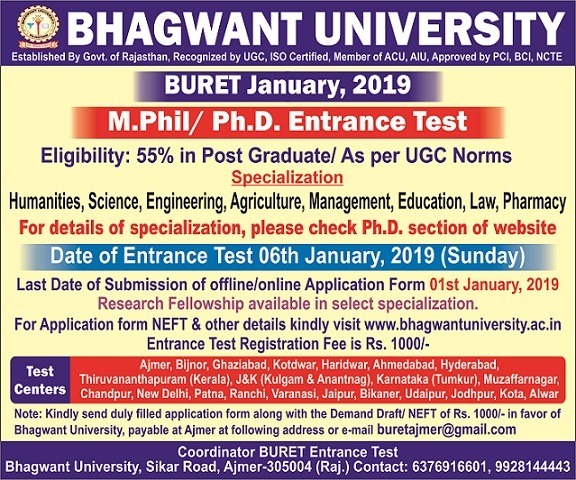 Bhagwant University started Doctoral Programmes in the year 2009. PhD Programmes in the University are offered for various specializations notified at the time of admission. The Doctoral Studies and Research Cell (Ph.D. Cell) is the co-ordinating administrative unit for the PhD programmes offered by the constituent faculties of the University. The University offers PhD programmes in various disciplines. The Admissions in various PhD programmes is scheduled twice in a year through the Announcements in the Newspapers and Website. The University will invite applications from the candidates through advertisement in the press and or on the website. Candidates, who intend to register for Ph.D. have to apply in a prescribed proforma. 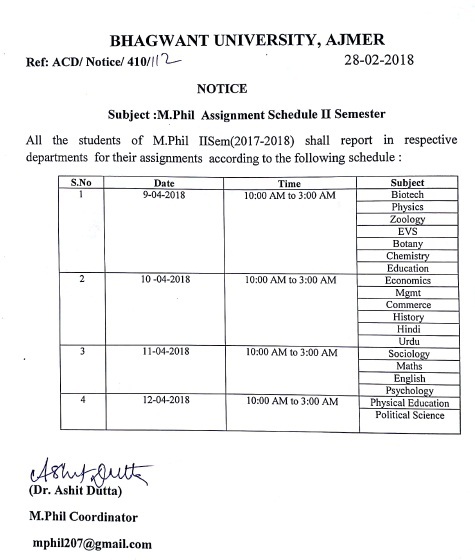 On the receipt of applications, an entrance test will be conducted for the eligible candidates irrespective of number of applications received, which will be followed by an interview by a committee consisting of the Director, Doctoral Studies & Research, Dean of the faculty concerned, Head of the Department(s) and a domain expert. The component weightage of the selection will be as under, while making the selection. The list for candidates selected for admission will be prepared on the basis of aggregate marks of both the components (i) academic record and (ii) entrance test. After admission, the candidate will be required to make research plan presentation carrying a weightage of 35%. 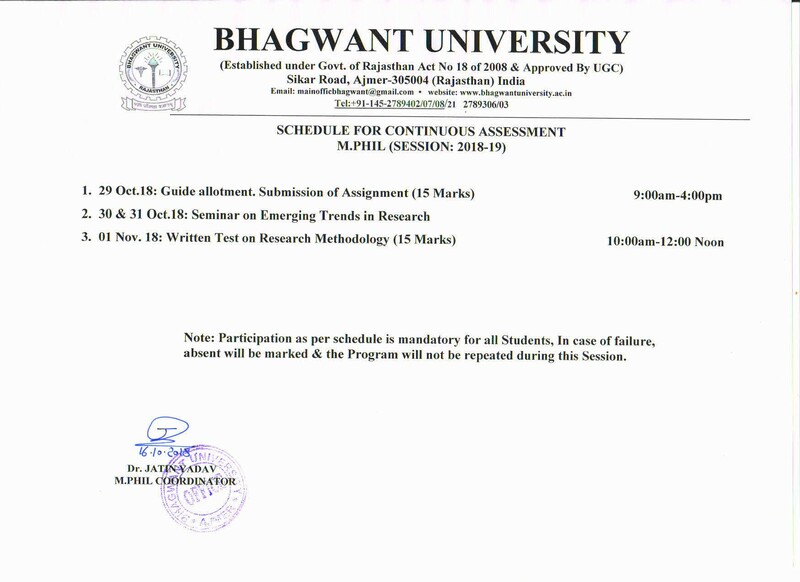 Weightage for Research Plan Interview : 35% The candidate who does not meet the minimum 40% marks in written test, 40% marks in personal interview and 50% marks in aggregate will not be considered for Registration and their admission may be cancelled. 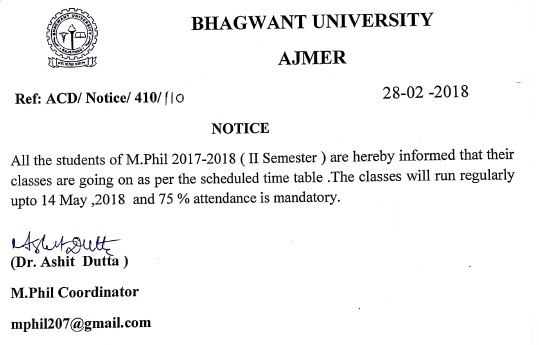 Provided however that the candidates who have passed the National Level Test like UGC/CSIR(JRF) examination / NET / SLET / GATE/teacher fellowship holder, M.Phil etc or its equivalent shall be exempted from appearing in the test and they will be considered deemed to have earned 35% score in the written test. On the recommendation of the committee, admission will be made on payment of prescribed fees and after the approval of the VC. The Committee will also assign guide to each candidate selected. Research scholars admitted through NET, GATE, SLET will get stipend through that agency. A few interested full time research scholars may be provided University Fellowship for Ph.D. ranging from 12k to 20k depending upon the area of interest, specialization, availability of project funds in that area, academic, research and experience of the scholar etc. Course work Requirement: The research scholar will have to first undergo a course work of total 12 credits as under: (i) Research Methodology (including Quantitative Methods) and Computer Applications. (ii) Literature Review on Topic of Proposed Research Work. 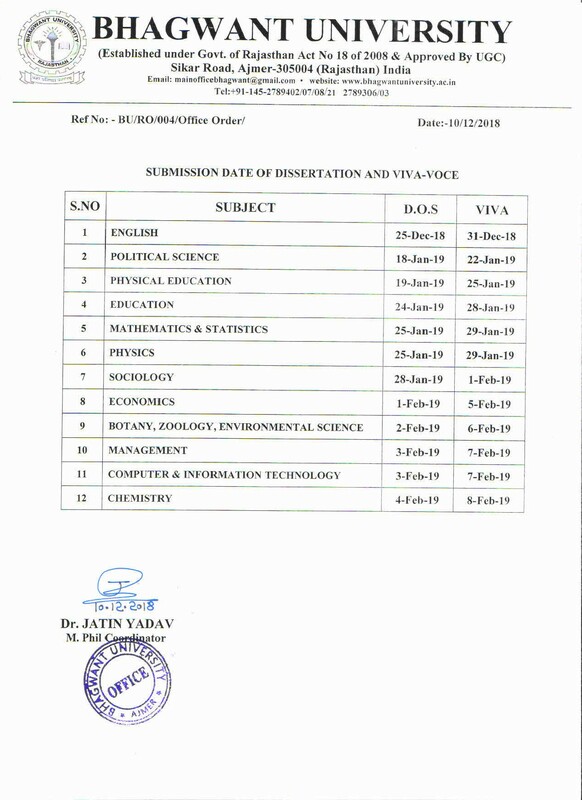 (iii) Subject Paper Recommended by Supervisor depending upon major area of research topic. (iv) Supervisor Approved Research Project Funding Proposal Candidates will have to complete the course work within the first six months of admission. Research Progress Committee The Research Progress Committee (RPC) will be formed for each student consisting of head of the department, Guide, Co-guide, if any, and two experts from research area to be nominated by the Supervisor and approved by VC, one of whom will be from outside the University will meet at least once in a year and monitor the progress of the research scholar and, based on the suggestions of the committee, the research scholar will take follow-up actions. 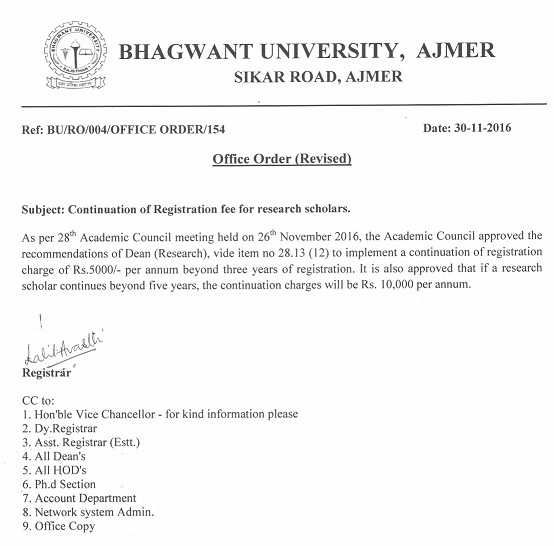 Research scholars are encouraged to undertake original research and publish research articles in reputed peer reviewed national/ international journals before submission of thesis as per the UGC norms. Research articles published in paid journals are not acceptable. 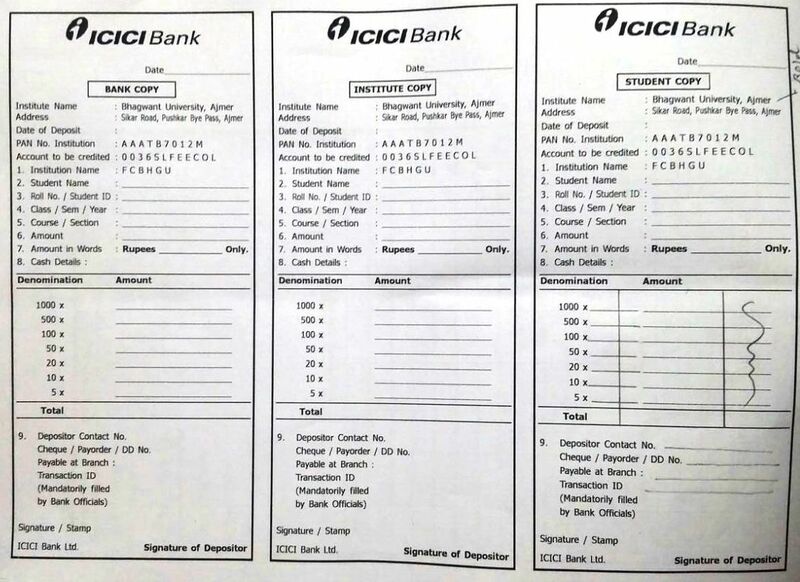 Statement to this effect in certificate by candidate must be incorporated. Ph.D. degree is valued by its publications. Hence, the scholars are advised to publish their articles in journal of repute with good impact factor, including International Journal of University Research. Plagiarism in thesis and publications is not acceptable and the candidate has to give a statement to this effect in the certificate. 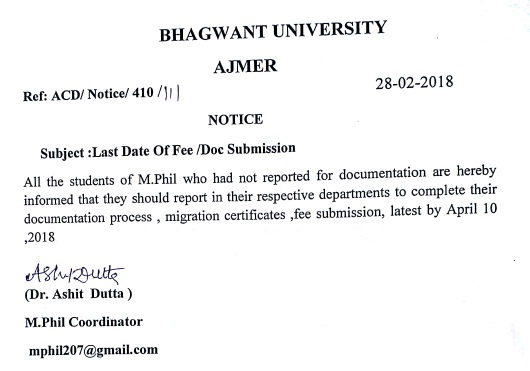 The thesis of all the Ph.D students who have submitted the thesis is sent to two referees for review by One State Level Expert and One National Level Expert. Thesis must be written and submitted in hard copy and soft copy in prescribed format as per UGC, Shodhganga and Inflibnet guidelines. The final thesis after awarding the degree is uploaded on the official website of UGC “Shodganga” through INFLIBNET.